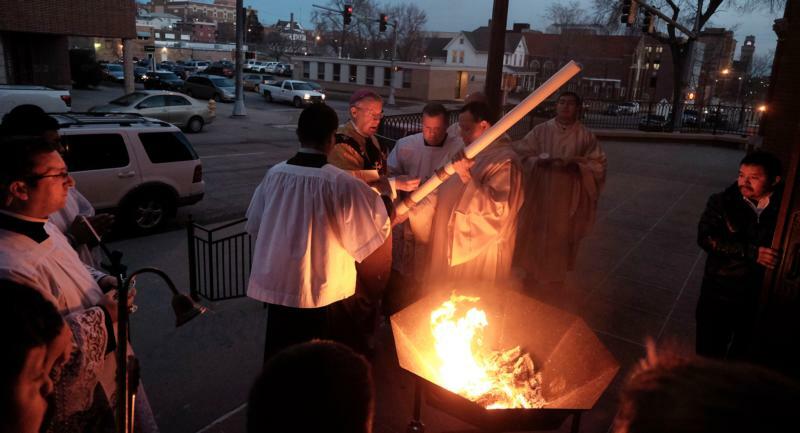 One of the great joys of the Easter Vigil is the lighting of the Easter fire, the lighting of the Easter candle from that fire, and then the lighting of each person’s candle from the Easter candle. Going from the dark of night to the light and heat of the Easter fire is transforming. Then, to watch that fire pass from candle to candle turning total darkness into flaming light is breathtaking. The value exhibited through this ritual is also breathtaking. With Christ in the grave, the world is dark, but with his resurrection, the light returns to us and is passed from person to person until the church is filled with light. This gesture that is relived at each and every Easter Vigil around the world yearly symbolizes what takes place in each church, each parish, each diocese: the light of Christ burns brightly in the lives of the Christian people who carry Christ with them every day. Last year, our parish was fortunate to share this Easter ritual with 15 people who were entering our church community at the vigil. Three of these were adults who had never been baptized, the rest were adults who had been baptized as Christians in other traditions who were now being welcomed into full communion. For over nine months, they had been in formation, learning about the beliefs and traditions of the Catholic faith, and being initiated into the life of this parish community. Now, at long last, they stood ready and eager to become full members of the Catholic community. While all of these men and women grew in faith during their time of preparation, one in particular stood out for his passionate embrace of all things Catholic: Steve. While many of these seekers participated in the parish retreat program, Steve took the extra step of becoming a member of the retreat team for the following year. While everyone participated in Bible study within the formation program, Steve wanted more, so he joined a men’s Bible study group. While everyone came to Sunday Mass, staying until they were dismissed following the homily — as the Rite of Christian Initiation of Adults prescribes — Steve came to daily Mass and served as an usher when needed. He had become an active parishioner long before his actual baptism. Following the Easter fire and the readings of how God had been involved in human history, the waters of baptism were then blessed by plunging the Easter candle into the font. Here was another sign that Christ, the Light of the World, conquered death with his resurrection. Now, our three adults were ready to be plunged into the sacred water to die to sin and to be reborn in Christ. As the pastor forcefully dunked them under the water they came up gasping for air. They had experienced a symbolic death and were now filled with the light of Christ. And their faces showed it: They simply beamed. The euphoria of our Easter celebration lasted only a few weeks, for Steve, the new Catholic who had jumped into the life of faith so energetically, was struck down by a stroke. He died after having received his last sacrament, the anointing of the sick. Dying and rising with Christ had moved from the symbolic to the real. Then, the light of Christ became real for us as well. These new Catholics gathered around Steve’s family and provided them with the strength and support they needed in their time of grief. Just as the fire was passed from person to person throughout the church at the Easter Vigil, so now the light of Christ was passed from friend to friend, from parishioner to parishioner, as each shared the light of faith they had within with those in need of comfort and joy. Christ is risen! Indeed, Christ is risen.